The success of the Future Fund campaign in inspiring donors means a new multi-million pound centre will see Newcastle University and the Great North Children’s Hospital lead the fight against childhood cancer. The Wolfson Childhood Cancer Research Centre is a facility where clinical and research teams from across the city can come together to advance their understanding of how to treat childhood cancers. 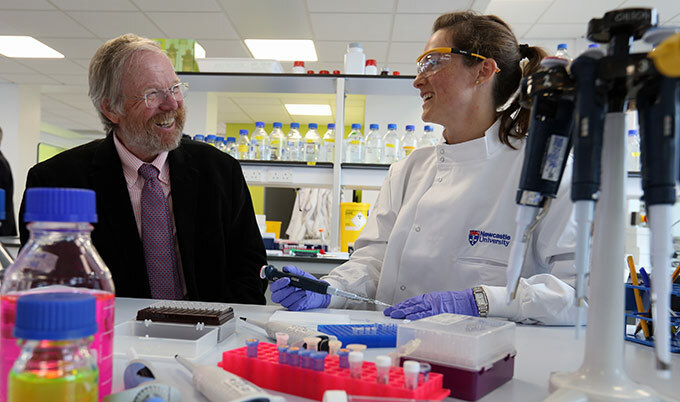 Two years ago, the Future Fund campaign was launched to raise £5.5m to build new laboratories in the heart of Newcastle University’s campus that will attract world-renowned experts in the field. The campaign has been a collaborative project between Newcastle University, North of England Children’s Cancer Research and Newcastle upon Tyne Hospitals NHS Foundation Trust. The Centre will be officially opened later today by internationally-renowned author Bill Bryson, who is a patron of the Future Fund. He said: “I have been personally touched by the experience of a friend’s young son who fought leukaemia with the help of researchers and clinicians in Newcastle. “When I discovered that a campaign had been launched to raise £5.5m to create a new centre for childhood cancer, where new children’s cancer therapies with fewer side effects could be developed, I was keen to offer my support. Work at the Wolfson Childhood Cancer Research Centre will focus on developing less toxic therapies with fewer side-effects, more effective treatment options for youngsters with advanced cancer and for those whose illness has returned. Professor Josef Vormoor, Director of Newcastle University’s Northern Institute for Cancer Research and Consultant Paediatric Oncologist at the Great North Children’s Hospital, leads the Future Fund campaign. He said: “Childhood cancer has been one of the success stories of modern medicine. Such have been the advances made over the past 30 years that eight out of 10 children diagnosed today will be cured. “However, cancer in young people remains a serious issue as it is one of the main reasons why children from one to 15 years of age die prematurely. “In 2014, we launched a campaign to raise funds for a new facility on the Newcastle University campus to enable our research team to further their work in childhood cancer, and ultimately give more youngsters a future to look forward to. Although the campaign to raise £5.5m has concluded, it is not the end as fundraising continues at pace to raise at least £300,000 each year to support the new life-saving research conducted by the centre. Many people and organisations have contributed towards the Future Fund campaign to make the opening of the Centre, based at Newcastle University’s Herschel Building, become a reality. In addition to a range of individual donors and community fundraising champions, The Wolfson Foundation invested £1.5m, Barbour Foundation, £1m; North of England Children’s Cancer Research Fund, £500,000; the Garfield Weston Foundation donated £500,000; and the Sir Bobby Robson Foundation is supporting the work carried out in the centre with a donation of £1m. Paul Ramsbottom, Chief Executive of the Wolfson Foundation, said: “We fund research of the highest international quality. “It is a particular pleasure to be able to support a Centre that embodies not just this excellence but also the aspirational aim of providing children with the opportunity to live healthy lives, free from disease. “We are delighted to be able to support this ambitious project and are honoured that the University has chosen to reflect the Foundation’s gift in the naming of the Centre. Dame Margaret Barbour, Chairman of global lifestyle brand Barbour and a patron of the Future Fund, said: “I am very happy to be associated with such a worthwhile research facility. “I established The Barbour Foundation in 1988 to help charitable causes, cultural and community projects primarily in the North East, and I was delighted that the Foundation could make a significant donation to the Future Fund. “Over the years, huge advances have been made in the treatment of childhood cancer, but there is still a way to go. Youngster Emma Bell looks the picture of health and happiness. Yet, three years ago the 12-year-old was diagnosed with a myeloid sarcoma the size of a large orange that was growing behind her nose and partway down her throat. The Macmillan Academy pupil required five months of intensive chemotherapy at the Great North Children’s Hospital to shrink the cancerous tumour and save her life. In February 2014, Emma finished her treatment and has been in remission ever since. Her parents were so impressed with her treatment that they got involved in fundraising for the Future Fund. Parents Lindsey and Steven, both 42, sister Amy, 15, friends, relatives, and Emma’s dance school have all taken part in a series of activities, raising a total of £9,500 for the charity. Mother-of-two Lindsey, who works for Middlesbrough Council, said: “When we were told Emma’s diagnosis it was the worst news imaginable. Within 72 hours our daughter started her chemotherapy. “Emma was amazingly strong throughout her treatment and it was an incredibly difficult period as she lost all her hair. “It is fantastic that a world-leading Childhood Cancer Research Centre has opened in Newcastle as it offers hope that everything possible is being done to give children with cancer a better future.